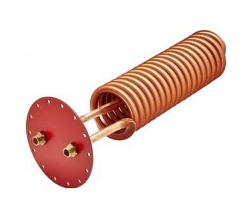 LK60 coil will fit all Akvaterm & Jaspi accumulators of 1000L and larger. It is a powerful finned copper coil / heat exchanger for domestic hot water or indirect heat sources like heat pumps or larger solar systems. Pipe connection is 1" (25mm) and the coil length is 1250mm. Diameter 170mm. Recommended maximum flow is 40L / minute. LK60 is delivered with a tank flange and a gasket.